Western Tailed Blue – Vetches, MilkVetches! 1. Choose other flowers for colour and nectar. Adult butterflies are most attracted to red, yellow, orange, and pink flowers. Adding some of these for colour is a great way to spruce up your butterfly garden. 2. Purchase and plant a few nectar plants. These plants should be placed in your garden so they can receive direct and full sunlight. Adult butterflies only feed in the sun. Locating a sunny area for your butterfly garden is an absolute must! 3. Create a planting schedule. Butterflies need a food source throughout their entire lifecycle, so be sure to plant flowers so that as one stops blooming a new one is starting to bloom. 4. Create resting and puddle areas. Butterflies like to rest in the sun to warm their wings. Have areas with flat stones in sunny spots for butterflies to land on. Butterflies also like we, sandy areas where they can drink from the water puddles. You can create this area by using a shallow pan filled with sand and water. Be sure to keep the sand moist at all times. The Female Karner Blue, a little different from Her blue male counterpart – is not actually blue! She is a little blue, and mostly Beautiful silver-grey with white borders on Her wings, and orange and deep dark charcoal-colored spots!…..Although Karners nourish themselves on only the blue lupine flower in their pre-pubescent stages, once, they come out of their pupas and fly, they nourish themselves on all other flowers in the surrounding areas, though as far as we know to this point, still stay in the general geographical area. If you wish to see Karners in bloom, there are many places around the Great Lakes of the U.S. where parks are designated for the Karner preservation. 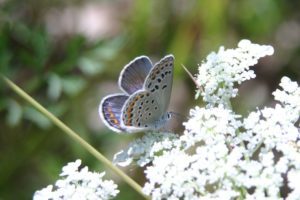 Within Canada, efforts are underway for their welcome return…..Late May to early June is the peak bloom time of the Karner Blue. For more info, feel free to visit: http://www.wiltonpreserve.org/conservation/karner-blue-butterfly. May 17th is Alpiny, NY’s Grand Lupine Festival!